The story that most captivated me, when I began researching for my novel, was that of Hiram Otterand Hallelujah Bay. The names alone are enough to make you prick up your, erm, eyes, am I right? The story goes that in 1890 or so Hiram, a powerfully-built ex-quarryman and Salvation Army stalwart, single-handedly created a path along the rock-jumbled West Weares to the beautiful cove which was visible from the cliff top, but at the time completely inaccessible on foot. Using his bare hands Hiram laboured to shift the boulders and rubble, quarry by-product carelessly tipped over the edge of the cliff in earlier times, and even shaped a few rudimentary steps down to the beach for the beskirted, or less nimble, picnickers he anticipated. But the times were a-changing, and beaches meant not just picnics, but mixed bathing, revealing clothing, and inappropriate frolicking. Poor Hiram, having cleared the way to the tempting little cove, noted with increasing dismay the behaviour of the beach-goers, and decided to take matters again into his own powerful hands. In spite of this, Hiram appears to be remembered fondly on the Island, the little beach he opened up for his neighbours named in his honour. Sadly, little trace remains of the inscriptions that he carved into the rocks, save (possibly) on one particularly massive boulder, where some think the word that appears might once have been ‘Jessu,’ though it now reads ‘Jessica.’ If you look closely, you can see the little serif flourishes on the first four letters, that must surely have been made by someone skilled in the stonemason’s arts; whereas the last three letters appear to have been punched out by a drill. 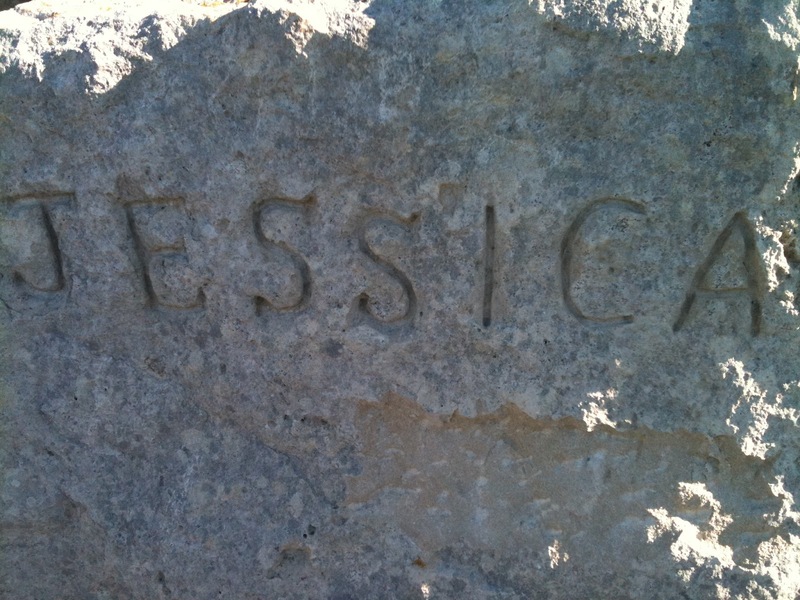 Yes, it does look a little like wilful, pointless vandalism – but I prefer to think that Jessica too has a story to tell, about the lover who, in the absence of trees upon which to carve his beloved’s name, took a drill to the serendipitous rock that already bore the first four letters. I hope she appreciated it. But I expect we’ll never know. 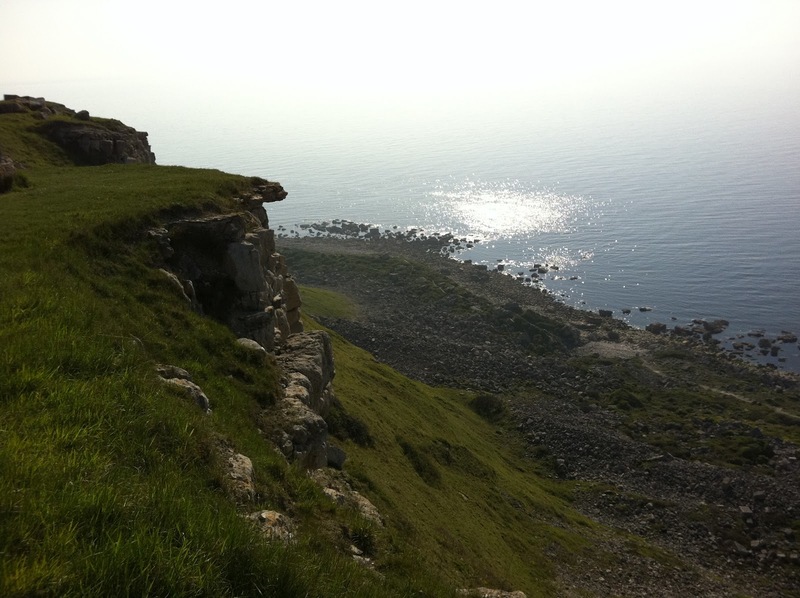 This entry was posted in Musings and tagged hallelujah bay, hiram otter, isle of portland. Bookmark the permalink. What a fantastic story…I can now hardly wait to find out where HIram Otter ends up next (in fictional form, at least). He sounds like a marine version of a Cold Comfort Farm character.